Awesome news: The new Hollywood Walk of Fame honorees for 2015 where announced on 18th June by the Walk of Fame Selection Committee of the Hollywood Chamber of Commerce in Hollywood, California and Daniel is one of them. Congrats Daniel! Raymond Chandler (posthumous), Eugenio Derbez, Will Ferrell, Jennifer Garner, Peter Jackson, Bob Kane (posthumous), Daniel Radcliffe, Paul Rudd, Snoopy, Melissa McCarthy and Christoph Waltz. When a date has been scheduled you ofcourse hear it. Thank you Hollywood Chamber of Commerce! I can't wait to be there and be joined by Chris Columbus and Chris Hardwick. What an honour. 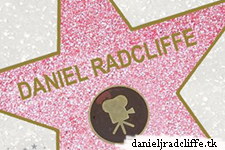 The Hollywood Chamber of Commerce is proud to announce that Daniel Radcliffe will be honored with the 2,565th star on the Hollywood Walk of Fame on Thursday, November 12th at 11:30 a.m. PST. The star in the category of Motion Pictures will be dedicated in front of The Dolby Theatre at 6801 Hollywood Boulevard. “Fans of all ages have been waiting in anticipation of Daniel’s star ceremony. They are constantly asking when it will happen. Finally, we have him here in Hollywood, and we are proud to dedicate his star on the Hollywood Walk of Fame,” stated Ana Martinez, producer of the Hollywood Walk of Fame ceremonies.